Coach Stevie Lyle has landed his final signing of the summer after beating off interest from several clubs to make Owen Griffiths a Wildcats player. The player, who is set to celebrate his 19th birthday in just under a week, has become his final marquee signing of the summer and completes the new coaches 2015-16 roster which he hopes will bring some long awaited success back to Wiltshire. Having grown up under the Cardiff Devils banner, Griffiths spent last season on the Isle of Wight where he helped the Raiders seal the South Conference Playoff Championship making 56 appearances, scoring 20 goals and 38 assists along the way, but despite experiencing success, the player felt the time was right to move on. “I spoke to Stevie through my previous coach at the Devils last year while I was still studying at school however changes were made in Cardiff and I personally felt moving to the Isle of Wight was the better option for me at the time,” the centre said after the deal was announced. 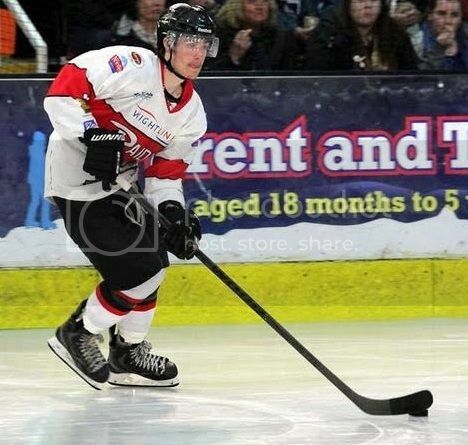 Having grown up alongside Wildcats defender Callum Buglass from an early age, Griffiths is also good friends with forward Adam Harding and has also iced with Jordan Hedley, Floyd Taylor, Toms Rutkis and Harvey Stead at international level and turned down offers from Manchester, Bracknell and the Raiders in order to play at the Swindon Ice Arena under Lyle. “I had a really great time with the Raiders and they have such a close group of people in the team and around the organisation. “Living with new team mates in a team house away from home is an experience I will never forget. “Jeremy Cornish, having played at the top level in the Elite League, helped mould my game and matured me as a player on and off the ice and watching and playing with former Wildcat player Jaroslav Cesky was unbelievable, I was astonished every time he went on the ice. Having played against EPIHL clubs during last season’s Challenge Cup, the player is well aware of what to expect when he takes to the ice for the Wildcats this time round. “The Challenge Cup as a bonus within the season for me. I wanted to use the games to test myself against the speed and intensity of a truly professional team and although the results showed the difference in the playing standards between the two divisions, it allowed me the chance to learn. Indeed, making the step up will give Griffiths the chance to grow his ability and the player continued: “Stepping up a league challenges every aspect within your game. “My training intensity has increased in preparation for the quicker and more physically demanding season. I’m really looking forward to playing with experienced teammates who can help not only with the time out on the ice but with the mental aspect of the game too. Talking about what he knew of the Wildcats fan-base, the player concluded: “The Challenge Cup games allowed me to experience the passion of the Wildcat fans and how committed they are to the team. Sponsorship opportunities starting at just £5 are available for Owen. For further information on how you or your business can get involved, please call Wildcats Marketing Manager Sally Price on 01793 886 857.